On March 8, 2018 Casa - Pueblito is celebrating the achievements of all the women in our partner communities – and with so many to celebrate, we’ll shine a light on the communities of Santa Julia and Estelí in honour of all. 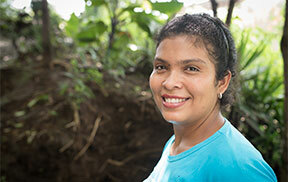 In 2008, the women of Santa Julia organized and formed the Gloria Quintanilla Women's Cooperative. Since then, the women of the cooperative have been fighting for basic services in their community such as water, electricity, and education. They also work to create employment opportunities for community members, and have implemented bio-intensive and climate smart agricultural practices to aid food sovereignty and access to water in the community. The women of Santa Julia and in our other partner communities play a crucial role when it comes to not only our community development projects, but also our Global Education delegations. Women work hard hosting students, organizing intercultural activities, and sharing their life experiences with visitors. They work towards a better future not just for their own community, but for the futures of Canadian youth who spend time living with them. For this, Casa - Pueblito is grateful. And now let's celebrate the leading women Estelí. Among the seven local community partners we’re working with this year, we’re excited about our new community partner Mujeres Organizadas Emprendedoras de Estelí. This organization works with women in vulnerable situations, such as those working in Estelí’s municipal garbage dump, to develop small business management skills and connect them with markets. We honor the work that the women in our partner communities put into making our community development and global education programming a success -- what we do would be impossible without them. We celebrate the progress that women have made in the face of violence, stigma, prejudice, and the patriarchal systems that surround us, while committing to continuing the fight and walking alongside these women for our collective liberation. As Lilla Watson, indigenous Australian activist, said: “If you have come to help me, you are wasting your time. If you have come because your liberation is bound up with mine, then let us work together.” Today, we celebrate the work that the women in communities all over Nicaragua are doing to help us all become free.